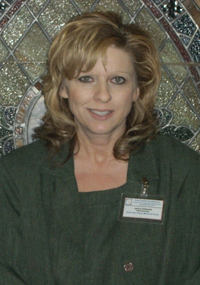 I am the Administrator of the Sarah Ann Hester Memorial Home in Benkelman, NE. I have been an employee of Rural Health Development for almost 5 years. Prior to that I was employed directly by the Sarah Ann Hester Memorial Home in various capacities since 1986. I worked in housekeeping and laundry during the summer when I was in college. I was a Certified Nurse Aide and a Care Staff Member (what we now know as Medication Aide) until I became a Licensed Nurse. I worked as a Charge Nurse and over time had various duties such as Nursing Scheduling, Staff Development Coordinator, Infection Control Coordinator, Assisted Living Director, and Social Services Director. I enjoy working with the residents of the facility and find the Nursing Home Industry a challenging career. My husband Mike and I currently live in Benkelman, NE. We are both life long residents of Dundy County. We have twin daughters, Jenna and Jillana, and have found that raising them in a small community has been a wonderful experience. Both girls are very active in school and I spend my spare time volunteering for and attending their activities. I am a member of the Benkelman Lutheran Church and have taught Sunday School and sponsored the church youth group. I enjoy being around and working with the youth in the community. I believe our challenge for the future is in keeping the small towns and communities viable. The Sarah Ann Hester Memorial Home, located in Southwest, Nebraska, is compassionately committed to providing quality of life for those in need of our care. The facility is a Medicare/Medicaid Certified Skilled Nursing Facility specializing in personalized service with a small town atmosphere. Trained Staff are on duty to provide the highest quality of care possible. Accommodations are available for long-term stays or short-term stays when rehabilitation to return home is desired. Private rooms are provided for all clients. Companion rooms are available upon request. The Skilled Nursing Facility also has an attached Assisted Living. The K.C. Stout Assisted Living Facility is certified for Medicaid Waiver clients and has accommodations of one room suites, two room suites, and apartments. If interested in residency, please stop by the facility or call at (308) 423-2179. Our staff would be happy to provide you with further information, answer any questions you might have, and discuss our ability to meet your needs or those of a loved one.